I’m Danielle and I am a teacher, military spouse, writer, runner, and reader. I graduated from the University of Idaho with a teaching degree, and then followed that up with a Masters from la Université de Poitiers in France. I’ve been teaching for five years now, working in Oregon, France, Germany, North Carolina, and now Puerto Rico. I’m gearing up for a new school and a new school year here in sunny Puerto Rico. I’ll be teaching 9th grade English in an English-speaking school here, and I’m really excited. I got to choose my own books, too! We’ll read Lord of the Flies, dystopian lit in lit circles, A Midsummer Night’s Dream, and The Housekeeper and the Professor. I mean, obviously. I’m an English teacher, right? One of my favorites that I read this summer is The Accident Season by Moïra Fowley-Doyle. It’s a hauntingly beautiful mystery set in Ireland, and it’s got it all: romance, drama, suspense, and a little bit of magic. I also *love* recommending books to students. This year, I’ll direct them to The Fixer by Jennifer Lynn Barnes (Veronica Mars meets Scandal), Nightfall by Jake Halpern (for fans of Mazerunner), and The Last Night at Circle Cinema by Emily Franklin. Some of my all-time favorites include the Lemony Snicket books, anything YA Dystopian, and Philip Pullman’s His Dark Materials trilogy. I’m so thrilled to be headed back to school! On the first day of school this year, I plan to have students complete The Daring English Teacher’s (free) Back to School Survey. While this is happening, I’m going to take pictures of each student. I have a class set of mini whiteboards, and I’ll have them write their names on the whiteboard and hold it up. I’ll take two pictures – one with the name and one without – and use these as flashcards to quiz myself at home. I have to learn these names quickly, folks – names are power! I’ll also get rolling in the first week with something academic. 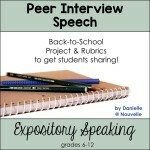 One of my favorite starter activities is a Peer Interview Project with my students. It works for everyone: they get to work on their speaking and listening skills, everyone learns about each other, and I get to learn about them! As a military spouse who’s constantly changing schools, it’s really important for me to be able to get to know my students quickly. This project is a great jump start! I love the whiteboard idea. I am planning to get a class set this year and try them out! Your experience teaching around the world is exciting and fascinating! I have always thought that I would love to participate in a teacher exchange program! 🙂 So nice to meet you in Vegas, too! I love your enthusiasm, Danielle! What a cool career that you’re afforded teaching opportunities in so many interesting places. Thanks for sharing! The whiteboard idea for learning many students names quickly . . . genius! I loved every word of this post…learning more about you…finding out about a great novels to read…and imagining your first day of school! Can’t wait to read more! It would be fun to compare those photos with shots of the kids from the end of the year too! I love my whit boards -and the students do too! Teaching in France sounds like a great experience!